In the Catholic tradition, the saints are not simply models or people to be admired. They are, above all, friends. When we have a devotion to a particular saint, we've found a soul companion, a spiritual guide. Barron recommends that we find a saint who is like you in personality, who struggled with one of the same things you struggle with, or who loved the same things you love. Find a heavenly soul-mate and make him or her part of your prayer life - read about them and pray with them. You might not connect with every saint, but chances are you'll find one whose style is agreeable to you. Also, and here’s the more challenging suggestion, choose another saint who bothers you, one whom you don’t really appreciate or who maybe rubs you the wrong way. It might be just this saint who helps fill you out, to realize in you that aspect of the holy you especially need. Now I don’t know which type of saint we have today for you. Is it one that is like you personally, one who struggles with the same things you struggle with, or who loved the same things you love. Or do with have a saint today, whom you don’t really appreciate, or who rubs you the wrong way. 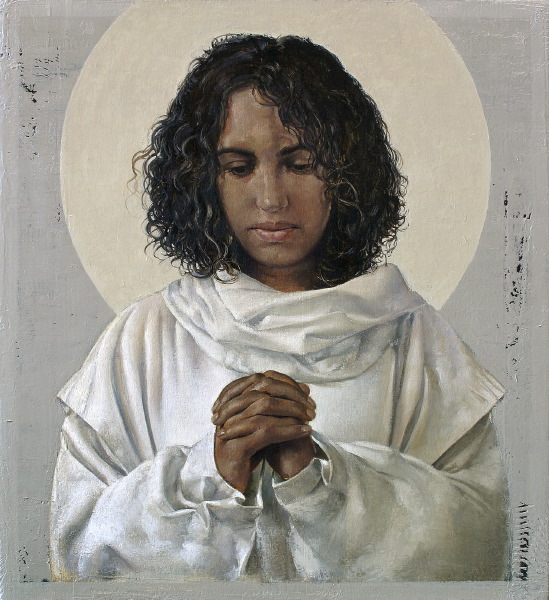 Either way I want to give some praise to Saint Monica whose feast day we celebrate today. Monica is a mother who never gave up on a wayward son named Augustine. Nor did she give up on her pagan and, at times, violent and unfaithful husband, Patritius, whom she won for Christ at the eleventh hour. Where Monica lived in North Africa, in the mid-fourth century, Catholic Christians were a minority. Most of the people were still pagan and there were plenty of sects and heresies as well. Catholic women, who were in a similar situation as Monica, with pagan husbands from arranged marriages, looked up to her as a model of patience. Her advice was to speak to their spouses when the opportunity was ripe, and never respond to a husband’s anger with abrasive words, rather keep silence and be patient. One day, when Augustine was around thirty-years-old, he told his mother that he was going down to the docks to see a friend who was embarking for Italy. He lied to his mother, foolishly imagining that if he told her the truth it would end up in an emotional scene. It was Augustine himself who boarded that ship to Rome. When Monica discovered this, what did she do? Did she retreat into despair? Did she complain to God? No, she did not. What she did do was she got on the next ship and followed her son to Rome. And when she discovered in Rome that Augustine had gone north to Milan, she took off for Milan. You all know the rest of the story, how she convinced her son to go and speak to the bishop, Saint Ambrose. This meeting between the two doctors was a major step in Augustine’s conversion, which came shortly afterwards. After the baptism of her son in 386, the two were inseparable. They settled for a time near the seashore in Ostia where Augustine, always the scholar, would hold weekly symposiums on the Faith. His mother held the chair of honor in every meeting, often offering her wisdom and her questions to the participants. It was here she and Augustine started speaking about the mystery of the Blessed Trinity that they both, as one mind, entered into an ecstasy, each receiving the same identical light and vision, a vision not of forms but of spirit. Saint Augustine writes in his Confessions that human language could not convey what they experienced that night in that divine light. Soon after this experience Saint Monica as a gentle mother told her son very gracefully that her mission was over and that she had a premonition that she would soon die. On her deathbed she had one request of her son, who by this time had determined to become a priest, that was that he would “remember her soul at the altar.” It was less than a year after Augustine’s conversion that Saint Monica died. She was a patient woman, a gentle mother, known for her silence and persistence. She told Augustine at the end of her life, “Son, nothing in this world now affords me delight. I do not know what there is now left for me to do or why I am still here, all my hopes in this world being now fulfilled.” He was thirty-three and she was fifty-one. Their bodies rest together today in the Church of Saint Augustine in Rome. If there was anything Monica taught her son Augustine it was to love well, which meant to love God above all things—and to place everything else in the light of that foundational and all-encompassing love. It is this deep love of God that enabled Monica to let go of her own career and family plans for her son, that enabled her to die in peace in a foreign land and be buried apart from her husband, that enables her even today, despite the 1600+ years that separate her life from ours, to witness and speak poignantly that same message that she lived and spoke to her son: let God set your loves in order.